Johnny Logan did it – but can Alexander Rybak do it too? When a former winner returns to the contest, it gets extra attention, but they also run a risk of failing. Johnny Logan is the only one to have won more than once. Though a few others did return to great results, just as many failed poorly. Johnny Logan did it. He won the contest in 1980, and when he returned to Eurovision seven years later, he triumphed once again. And when he came back as songwriter in 1992 he won the contest for a third time. And we shall not forget he also penned the second placed song in 1984, Terminal 3 sung by Linda Martin. But there is no garantee you will win or make a great result again just because you have won before. To win again you’ll need a great song. However, Johnny Logan is not the only winner to return to the contest and make a great result again. So did Gigliola Cinquetti. She was the first Italian winner back in 1964 and ten years after she came second at the 1974 contest held in Brighton. But just as Napoleon, she was defeated by Waterloo. To finish the list of Eurovision winners that came back and made a good result we also have to mention Carola, Anne-Marie David, Idabelle Aubret and Lys Assia. Will Rybak do a Logan? 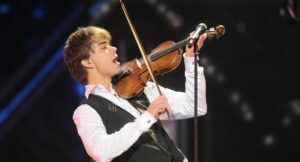 But Alexander Rybak still has to prove he knows how to write a Eurovision winner again. Although his song is among the favourites this year, you never know, how it turns out. As a former winner, you are guaranteed a lot of extra attention, which can help towards a good result. But undoubtedly there is also high expectations. Dana International won the contest in 1998 with the song Diva, which were a hit all over Europe. But when she returned i Düssrldorf in 2011, she didn’t managed to get a spot in the Grand final. Her song Ding Dong got only 38 points and a 15th place in the semi-final – which is not enough to quality for a final. She did however write the Israeli entry in 2008, The Fire In Your Eyes, that ended at a 9th place in the final that year. Dana International’s successor as Eurovision winner – Charlotte Nilsson (Charlotte Perrelli) in 1999 – didn’t do much better, when she made a comeback in 2008. She was close not to qualify for the final, where she only got a 18th place. It’s still an open question wheter Alexander Rybak will do a Logan or a Perrelli in 2018. Germany won the contest for the second time in 2010 with Lena and the song Satellite. The year after, she represented her country once again. With the song Taken By A Stranger, she finished 10th. With the last name Nilsson, Charlotte won the 1999 Eurovision Song Contest with the song Take Me To Your Heaven. Nine years, and a new last name, later she was back representing Sweden once again. Her second attempt, Hero, reached the final, but came 18th. With the song Diva, Dana International won the Eurovision Song Contest in 1998. She returned to the contest in 2011, but the song Ding Dong didn’t have the same attraction to it, and she failed to reach the final of the contest. That’s the worst comeback seen in recent years. In 1993, Niamh won the Eurovision Song Contest for Ireland with the song In Your Eyes. It took 17 years before she came back to the contest. That happened in 2010, where she sang It’s for You. With 25 points, she ended third to last, and as such her return was anything but success. For Eurovision fans, Carola is one who doesn’t need much introduction. She won the contest in 1991 with the song Fångad Av En Stormvind. In 2006, she took part once again and this time she also did quite well coming fifth with Evighet (Eternity). The Norwegian duo Bobbysocks consisted of Hanne Krogh and Elisabeth Andreassen. Both have taken part again at the Eurovision Song Contest after their 1985 win with La Det Swinge. Hanne was a part of Just 4 Fun in 1991, which was internally selected by NRK that year. They got a 17th position in Eurovision. Elisabeth did better, when she made her comebacks. First in 1994 with Duett sung together with Jan Werner Danielsen, which finished 6th, and again solo in 1996 singing I Evighet (In eternity), where she came second. Most successful comeback, that title belongs to Johnny Logan. He first won the Eurovision Song Contest in 1980 with the song What’s Another Year. Seven years later, he came back with Hold Me Now – and won once again. As two victories wasn’t enough, he returned as songwriter on Linda Martin’s Why Me in 1992, which also won the contest. Israel’s first win at the Eurovision Song Contest came in 1978 with Izhar Cohen, joined by band Alphabeta, and his legendary A-Ba-Ni-Bi. Cohen took part once again in 1985 where he ended 5th out of 19 with the fun up-tempo song Olé, Olé. Quite a good comeback result. In 1973, Anne-Marie David represented Luxembourg at the Eurovision Song Contest and won with Tu Te Reconnaîtras (You’ll recognise yourself), which nowadays is considered a Eurovision classic. She returned to the contest in 1979 representing her native France. Her comeback entry Je Suis L’enfant Soleil did well as it finished in 3rd position, but isn’t the big hit her first winner is. Gigliola Cinquetti had quite a successful return to the contest 10 years after her 1964 win with the classic entry Non Ho L’età (I’m not old enough). Her Si from 1974, didn’t win, but came second only losing out to ABBA. Un Premier Amour (A first love). That was the title of Isabelle Aubret’s Eurovision winner from 1962. Six years later, in 1968, she took part once again representing France. With the song La Source (Spring) she finished third in her comeback. Performing the song Nous Les Amoureux (We, the lovers) Jean-Claude won the Eurovision Song Contest in 1961 representing Luxembourg. He returned 20 years later, in 1981 with the song C’est Peut-être Pas l’Amérique (It may not be America) and scored a middle position ending 11th out of 20 participants. In 1957, Corry won the Eurovision Song Contest for the Netherlands with the song Net Als Toen (Like it use to be). When she returned to the contest, already the following year, she came in on a tied last place. So, not a successful return. 10 years ago – What has become of Eurovision’s Top 10 from 2009? Liked what you've read? Subscribe to our Eurovision news! ← Semi-final 1 2018: How accurate were the bookmakers? Are all Eurovision fans obsessed with Melodifestivalen – and why? Which system do you prefer for a national selection? Reliable news you can count on, In-depth articles, 2D and 3D videos... all from the world of Eurovision. Welcome to EuroVisionary - a website dedicated to the Eurovision Song Contest, its national finals and current as well as previous participants. © EuroVisionary.com, 2008-2019. All rights reserved.